SpaBoom's spas have sold over $1M in instant online gift certificates in just over a year, proving assumptions that spa clients are receptive to purchasing online, then printing or emailing to gift recipients right at time of purchase. Online gift certificate sales replace traditional fulfillment, and save spa personnel for focusing on developing client relationships other spa development activities. SpaBoom announced that its spas have sold a collective total in excess of $1M in Instant Online Gift Certificates, with a highly lucrative Mother's Day holiday providing the final push through the million dollar barrier. SpaBoom's instant gift certificates can be emailed or printed at time of purchase from a spa's website, and come automatically branded with a spa, salon or massage therapist’s logo. 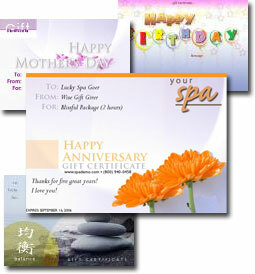 SpaBoom's spas averaged almost $2,700 each in online gift certificate sales this Mother's Day, alone. The top 50% generated over $4,500 each, with the very high sellers generating over $7,100 each in sales. Interestingly enough, almost half of the sales occurred within the two days prior to and actually on Mother's Day, affirming the assumption that people really do wait until the last minute to purchase gifts, and when they're given an option, they take advantage of unique online buying opportunities like SpaBoom's Instant Online Gift Certificates represent. Adopting SpaBoom's Instant Online Gift Certificates frees up considerable spa staff time, since all fulfillment occurs instantly and online in lieu of via time consuming traditional fulfillment processes. Additionally, spas receive GC Management, which provides spas with analysis helpful to staffing and scheduling-spas always know how many gift certificates have been redeemed and how many remain outstanding, key data for managing spas. SpaBoom helps spas take full advantage of their websites by providing instant online gift certificate functionality and management, appointment requests and dynamic website design. Simply put, we’re here to make your website work as hard as you do to build your business and boost your bottom line. To learn more, please visit: http://www.spaboom.com and http://www.spaboomblog.com. Media contact: Stephany Toman, 800.940.0458, Ext. 803.